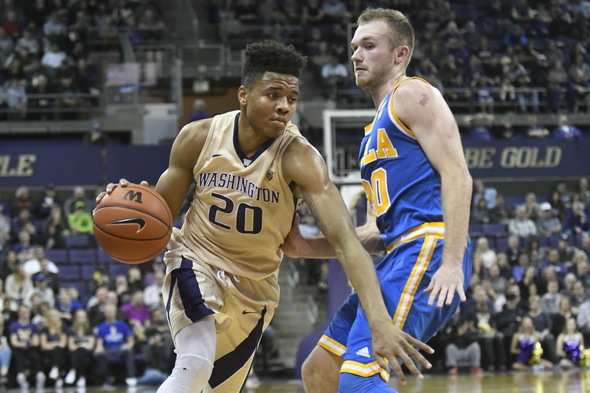 University of Washington freshman Markelle Fultz did the expected, saying he is making himself eligible for the NBA draft, where he is expected to be among the top picks, perhaps No. 1 overall. University of Washington freshman Markelle Fultz confirmed a foregone conclusion Friday when he announced he would enter the NBA draft. Fultz made first-team All-Pac-12 this season and led the conference in scoring at 23.3 points per game, the highest average for a single season in more than 20 years. “The last three years of Markelle Fultz’s basketball career have been nothing short of amazing,” said Romar. “He has made one of the quickest improvements of any athlete I’ve seen in a long time. Markelle has decided to enter the draft and we totally support his decision. In addition to his scoring average, Fultz averaged 5.9 assists and 5.7 rebounds while setting the UW freshman scoring record with 579 points. He is the first guard in 25 years to average 20-5-5 and is on the watch lists for numerous national awards ,including the Bob Cousy Award, Naismith Trophy, John R. Wooden Award and the Waymon Tisdale Freshman of the Year Award. According to many mock drafts, Fultz is a strong candidate to be selected No. 1 overall by the Boston Celtics. Duh, this is news? What would be news is to find out he knows where Red Square is…. What? Whoah, nobody saw that coming! You didn’t think he wanted another year with Kingma? First the NBA swipes our team, then they ruin the local men’s college BB program. And we are supposed to grovel for the return of their Pro Wrestling-like product…. Why?